Cut the chicken breast into thin slices and season to taste with salt and pepper. Heat the oil and 45 ml of the butter together. Fry the chicken breasts until golden. Remove from the pan with a slotted spoon and set aside. Add the remaining butter to the pan. Fry the onion and mushrooms until cooked and golden. 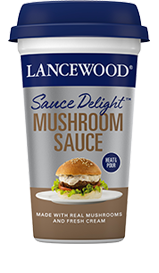 Add the chicken and the LANCEWOOD Sauce Delight™ Mushroom Sauce. Mix in the cooked penne pasta and milk. Heat through. Add lemon juice and seasoning to taste. Sprinkle Parmesan and parsley over just before serving. 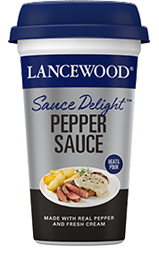 This dish will be equally delicious if you use 250 ml LANCEWOOD Sauce Delight™ Mushroom Sauce and 250 ml LANCEWOOD Sauce Delight™ Pepper Sauce. When you have plenty of lemons – squeeze out the juice and freeze in medium sized ice trays. Use as needed. 1 medium sized block equals juice of half a lemon. Add fried bacon for a smoky flavour. 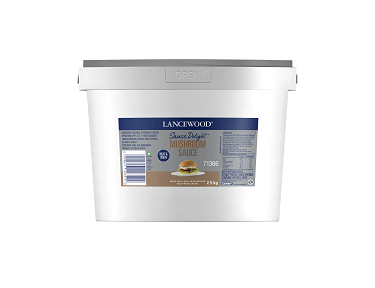 Leave out the penne pasta and use as pasta sauce over pasta of your choice or serve with brown rice.